CINCINNATI (AP) — Keon Broxton homered twice and drove in four runs, and Chase Anderson pitched two-hit ball for six innings, leading the Milwaukee Brewers to an 8-2 victory over the Cincinnati Reds on Friday night. The Brewers won their seventh straight against the Reds, their best such streak against Cincinnati in franchise history. Milwaukee is 7-1 overall in the season series. Broxton had an RBI single, a solo homer, and a two-run shot as the Brewers pulled away with five runs in the ninth inning. Broxton also dashed from third to score during a rundown play in the eighth. Ryan Braun came out of the game in the seventh inning with a stiff back, leaving the Brewers missing two regulars. Christian Yellich also was sidelined by a sore back. Braun missed six games last month with a sore back as well. Broxton and Anderson pulled them through. Anderson (6-6) completed his rough month with one of his best performances. The right-hander was 1-3 in five previous June starts. He limited the Reds to Tucker Barnhart’s single through the first five innings. 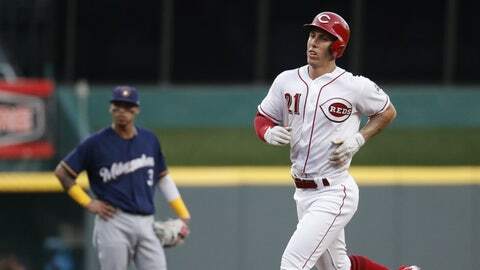 Reliever Michael Lorenzen connected in the sixth inning for his second homer in a week and his fourth career. Broxton singled home a run in the second inning and led off the fourth with his first homer of the season off Sal Romano (4-8), who has lost all of his five career starts against Milwaukee. Broxton was called up on Tuesday when Lorenzo Cain suffered a groin strain. In the eighth inning, Broxton walked, stole a base and made it safely home from third when the Reds caught Orlando Arcia in a rundown at second base. He completed his big night with a two-run shot in the ninth off Jackson Stephens for his third career multi-homer game. The NL Central leaders improved to are 48-33 at the midpoint of their season. The Brewers were 42-39 last season, when they finished second to the Cubs. Brewers: Yellich’s back tightened as he ran to first base in the series opener on Thursday. Manager Craig Counsell said he could be available in a day or two. Broxton took his place in center field. Reds: Homer Bailey threw 100 pitches in his third minor league rehab appearance on Thursday night without physical problem, but had trouble controlling his fastball, interim manager Jim Riggleman said. Bailey has been sidelined since June 2 with a sore right knee. He’s 1-7 with a 6.68 ERA. Brewers: Jhoulys Chacin (6-3) is 0-2 with a 4.67 ERA in five career appearances at Great American Ball Park. Reds: Rookie Tyler Mahle (6-6) is undefeated in five June starts, going 3-0 with a 2.30 ERA.